The sale of the Yeats collection at Sotheby’s in London brought mixed results: the highest estimated lot failed to sell but strong competition emerged elsewhere. 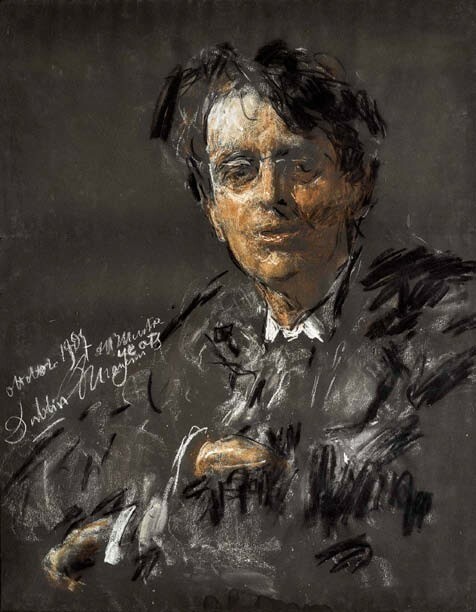 A chalk portrait of the WB Yeats by Antonio Mancini sold at Sotheby’s for £90,000. It was knocked down to Pall Mall dealer Philip Mould. The build up to the event drew some controversy with cultural figures in Ireland voicing concern that important items relating to arguably the country’s leading artistic family would be lost to the nation. Two days before the sale, Seamus Heaney’s widow, poets Michael Longley and Paul Muldoon were among 80 people who signed a letter to the Irish Times, urging Ireland’s arts minister to intervene. On the day, funds were made available for key acquisitions. The National Gallery of Ireland bought 10 lots including portraits, sketchbooks, watercolours and photographs. Its purchases included a portrait of Elizabeth Corbet ‘Lolly’ Yeats by John Butler Yeats (1839-1922) from c.1899 that took £42,000 against a £20,000-30,000 estimate. Potentially the most valuable lot in the sale – a cache of more than 130 letters from WB Yeats to his first lover, then life-long friend and author Olivia Shakespear e s t imat ed at £250,000-350,000 – failed to attract a single bid. This meant the top lot was a late oil by Jack B. Yeats (1871- 1957) – The Sunset belongs to you from 1951. It sold just above hopes at £170,000. Elsewhere in the sale, London dealer Philip Mould secured a chalk portrait of WB Yeats by Italian artist Antonio Mancini (1852-1930). The 1907 study went over eight times its £8000-12,000 estimate before it was knocked down at £90,000.